Cherry toms moved to greenhouse & growing better than ever! 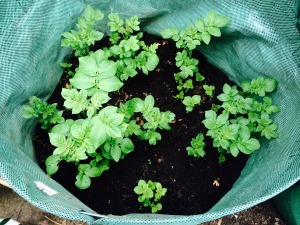 To my utter amazement, my potatoes seem to be doing OK. 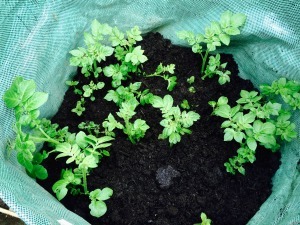 So last week I decided I had better earth them up – I think that’s the right phrase… Anyway, I covered as much of the growth as I practically could whilst leaving the growing shoots free to grow some more before repeating the process. Don’t know how clear it will look in the pics, but I have shown both the varieties I am trying to grow. 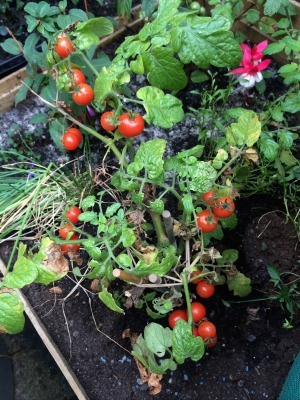 The final pic is of my TomTatoe that hasn’t got the message yet that it might be a little late to still be growing tomatoes outside, does look a bit pathetic now, but as I’ve learnt that potatoes can stay in the soil well after the foliage has died off, I will let the plant be for now. Still can’t really believe that you can grow potatoes on a tomato plant? Have you successfully grown anything weird and wonderful?